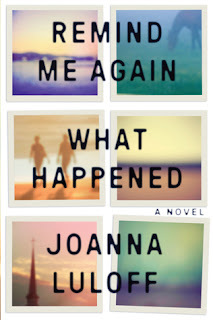 Remind Me Again What Happened by Joanna Luloff is a recommended debut novel about friendship and memories. Would you choose the same lover and friend if you lost all of your past shared memories with them? 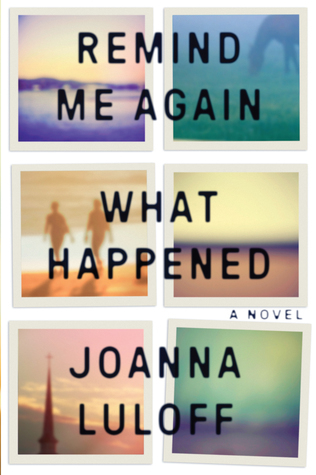 Claire is a journalist who has awakened in a hospital room in Florida. She has no memory of who she is and how she got there. Apparently she was bitten by a mosquito and contracted Japanese encephalitis while on an assignment overseas in India. She was lucky enough to survive, but part of the unlucky group of survivors who have lasting damage to their nervous systems. She suffers from seizures and a complete loss of memory. Her husband, Charlie, and best friend, Rachel, have flown in and brought photos, letters, and memories to help her. Once she is able to leave the hospital, she moves back to the house in Vermont with Charlie. Here Rachel and Charlie go through boxes of her things trying to help her remember who she is and her relationship to both of them. Claire, Charlie, and Rachel all shared a house years ago when they were in grad school. They have a long documented relationship with each other. So why does Claire have an uneasy feeling that the whole story isn't being told and that there are secret resentments being unsaid? A picture emerges that she is an independent and fearless woman, who travels overseas and does whatever it takes to get her story written. The novel unfolds through the alternating points-of-view and stories of the three main characters. With Claire's memory gone, do the three have any reason to continue a relationship with each other? Claire was distancing herself from Charlie before her illness. Rachel ruminates that it was Claire who led the continuing friendship between the three. While most long-term relationships require much forgiveness and forgetting of flaws, the myriad of details about each character's life make it clear that Charlie and Rachel haven't forgotten or forgiven past grievances and they are full of resentment. They aren't confronting Claire, but she senses it. Will Charlie and Rachel be able to help them all find a way to continue their relationship without any input from Claire? Basically the novel is well-written and the characters are all developed as individuals. For a rather short novel, however, it felt a bit longer because it is bogged down by all the backstory of the relationship between the three and you really begin to wonder why they remained friends. You may also find yourself secretly encouraging Charlie and Rachel to be honest and tell Claire the truth and help her truly remember her life. Disclosure: My review copy was courtesy of Algonquin Books.